The RASRL Collection can overwhelm with its thousands of papers by individual students, so when we come across writers who have a body of work in RASRL, we take note. Margaret Lam, featured at Thinking Locally, is someone we’ve come to know through her research and writing as well as her correspondence with Andrew Lind. This post features Laura Siu, sociology major, treasurer of UH’s Sociology Club, which published Social Process in Hawaii, and a 1941 UH graduate. Laura’s papers are a good representation of the courses taken and the research methods being taught to undergraduates. Her earliest paper found in the RASRL Collection is “A Sociological Study of the ‘Roosevelt’ Family” for Sociology 267, dated November 1939 (Box 2 Unprocessed Papers). Appended to the narrative is a detailed chart showing kinship, gender, ancestry (a Cuban in the family), occupation, and residence. This assignment was an exercise in looking closely at and noting precisely the relationships in a family over time, skills necessary to sociologists. As was often the case, the family’s name had been changed to provide privacy. In 1939 the choice of “Roosevelt” would have been a nice touch. Laura contributed to a group research paper. “Slums in Honolulu” (Box A-5) was co-authored by Hannah Tyau, Ruth Wong, Tadashi Uchigaki, Ryoichi Yamasaki, Hidehiko Uenoyama, and Tadao Beppu. Committee papers focused on large, complex topics, such as juvenile delinquency or, in this case, a notorious area in Honolulu. A group of students would provide historical background on the topic, gather statistics, produce a scatter plot map to show population density or locations of incidents reported, interview experts, and include case studies. Laura’s committee paper includes photos, a map, and graphs noting the location and ethnicity of residents in the area. Working in committee, students learned important skills, such as delegating tasks and monitoring individuals’ progress to completion since the fate of each researcher rested on the efforts of all: students received a group grade. Incidentally, Laura’s name appears first among the authors, a non-alphabetical list. 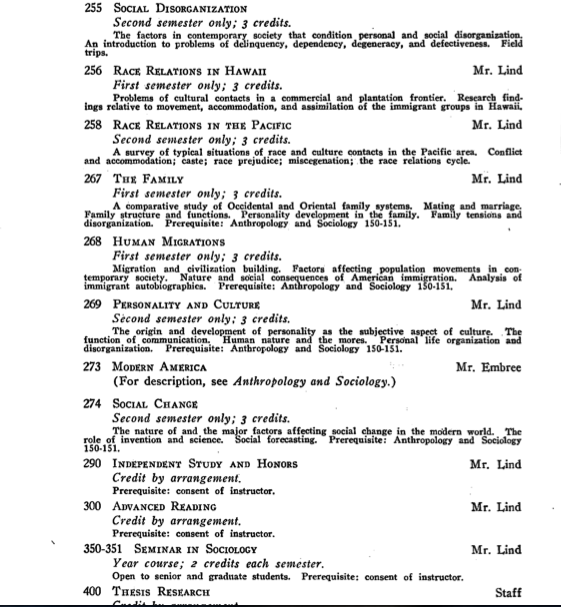 In June 1941, Laura submitted “Occupational Succession of the Chinese People in Hawaii” (Box A-5) for Sociology 290, likely the final course for her major. In this paper, she provides a history of Chinese immigration to Hawai‘i and the occupational pattern of this ethnic group. Although the Chinese initially had been farmers or worked on plantations, she writes, when their farms failed or their contracts expired, many moved to urban areas and became clerks, proprietors, and teachers. The most impressive parts of this paper are a survey of several hundred Chinese students from middle and high schools and the University and her interview with an eighty-seven year-old resident of Palolo Chinese Old Men’s Home who had arrived in Hawai‘i at age 12. Laura’s most interesting papers were submitted during her junior year. “A Study of 42 Filipino Barbers,” August 1940 (Box A-5) for Sociology 256 follows a formula common to “study” papers. Opening with a brief economic and social history of Filipinos in Hawai‘i, she focuses on the effects of the gender imbalance for this “bachelor” ethnic group and their shift from laboring on plantations to barbering in urban Honolulu. According to Laura, in 1930, out of the 253 Honolulu barbers in Honolulu, forty-six, or more than 20 percent of them, were Filipinos. Based on her personal observations, interviews with barbers, and research of tax office records, she estimates that by 1940 the number of Filipino barbers had increased, although she doesn’t offer figures to support this. In a footnote, she provides the names and addresses of the eleven Filipino-owned barbershops in 1940 in urban Honolulu, valuable information for any researcher interested in this topic during the pre-war period. “This writer,” as Laura refered to herself, surveyed forty-two barbers in twelve shops in the central business area. ‘A‘ala Street was the main focus not only because of its concentration of barbershops but because it was a neighborhood she knew well. She collected basic information – number of hours worked, wages earned, and kinds of amusement pursued. Blue laws were in effect so the pool and dance halls, favorite pastimes for the barbers, were closed on Sundays. If I marry I marry Filipino. Portoguese wahine good time like. Haole girl – I know one Filipino man he marry one haole girl, but only all same whoa [whore] kind wahine, you sabe. Alright. Pake and Japane girl, good, but mama, papa too much hoohoo [huhu]. . . . You marry Filipino girl no more trouble. She also explains her methodology. She would establish rapport by engaging them in “friendly conversations” that “appealed to their egos.” In short, she would share a bit about herself to gain trust, putting the women at ease, then lead them into a guided conversation. She estimates that between thirty-five and fifty prostitutes solicited on ‘A‘ala Street. She speculates that Puerto Ricans as a group have a more accepting attitude toward prostitution and notes that prostitution seems to run in some families. Laura reported that about three-quarters of her interviewees hadn’t gotten past the fourth grade but nearly all who are mothers were very interested in the educational welfare of their kids. My biggest boy wants to play the clarinet so I buy him one. It cost me $85.00 and now my number 2 boy wants an accordion and I buy him one. When the kids practice and I home, they sometimes drive me crazy. But anyhow I’m glad the kids get what they like. I give ‘em anything if they like learn. Maybe someday they will play in the orchestra. All wanted to make enough money to buy homes in “exclusive residential neighborhoods in the city”; three women not only already owned homes but had additional properties that they rented out. More than 80 percent of the women gave economic necessity as the chief reason for becoming prostitutes. Laura asked them about their backgrounds – parents were divorced or had lived as common law in crowded living conditions in slum areas. She recorded the occupations of their fathers and family income levels and asked them about their first jobs after leaving school to help support their families. Commonly, their first jobs had been as domestics in Army and Navy homes where they met servicemen; three had worked as “door maids” in brothels during the Depression when jobs were scarce. They said they saw “white girls” making good money, so why shouldn’t they. Customers of the younger and better-looking women were usually civilians and Filipino plantation workers, and the women made an average of $350 per month (adjusting for inflation that would be nearly $6,000 in 2014). The older ones serviced soldiers and sailors and averaged between $150 and $200 per month. As she had queried the Filipino barbers, she asked the women which race they would prefer to marry. Aside from men of their own ethnic groups, they seemed to agree that the next best choices were Chinese and Korean. Laura’s topics were interesting and she did a competent job of getting most of the essential facts. She invariably included quotations that not only captured the attitudes of the speakers but their individual personalities. It’s easy to see in her work how closely sociological investigations resembled journalistic reporting. In her papers, one could sense her personality as well: a confident young woman who easily engaged people and won their trust. She had poise and brio and was comfortable with people quite unlike herself. After we learned she worked at a lunch counter whose customers were prostitutes and likely located in the vicinity of Filipino barbershops, we tried to find out more about her. Many students wrote about their neighborhoods, and some RASRL writers could offer detailed insider views of their communities because of their families’ businesses. Those who worked in grocery stores offered vivid and often humorous descriptions of neighborhood denizens. But Laura wasn’t just another student working part-time in her family’s shop; she was, according to the 1940 census, a proprietor of a lunch counter with employees, a college student who had worked a full fifty-two weeks in 1939. No wonder her name was first on the committee paper: she was intimately familiar with the ‘A‘ala neighborhood, a slum district of Honolulu that included Chinatown. Polk’s Directory of the City and County of Honolulu, 1940-41 yielded up the correct name of her hotel, Kyuyo, but no Laura Siu. However, the publishers of the directory must have been familiar with the vagaries of spelling, especially of Chinese names, so it suggested that readers take a look at similar sounding names. And there we found Ngit Seu whose listed occupation was “confr” — confectioner. “Same” indicates that her shop was also her residence. Women in history – and RASRL is now history – have been lost through surname changes (not to mention misspellings) of their last names. We don’t know if Laura married but if she did she certainly would have taken her husband’s surname, and Laura Ngit Siu/Ngit Seu became Laura Someone Else. Perhaps she continued to own and operate her store (the name of which we don’t know) on ‘A‘ala after graduation, maybe she moved to the continent, or went to live in China and got stranded due to the War but made her way back to make that Pan Am flight. We have tantalizing tidbits that hang suspended. With Laura we gave into a temptation that we sometimes have about RASRL writers: imagining Laura standing at her counter with an array of Chinese sweets in front of her, ready to wait on neighborhood folk – including, of course, prostitutes and Filipino barbers – as well as the increasing new arrivals in Honolulu, defense workers and soldiers and sailors, many of them looking for an honest date. She would have known just how to handle any of these fellows who had been bold enough to ask her out. She was a woman of the world but more importantly, she knew her way around ‘A‘ala Street.